On Thursday, March 23rd, 2017, FairWind Sp. z. o. o. accepted the “Forbes’ Diamonds” award for the top ranking in our category in Forbes’ prestigious annual list of financially successful companies in Poland. 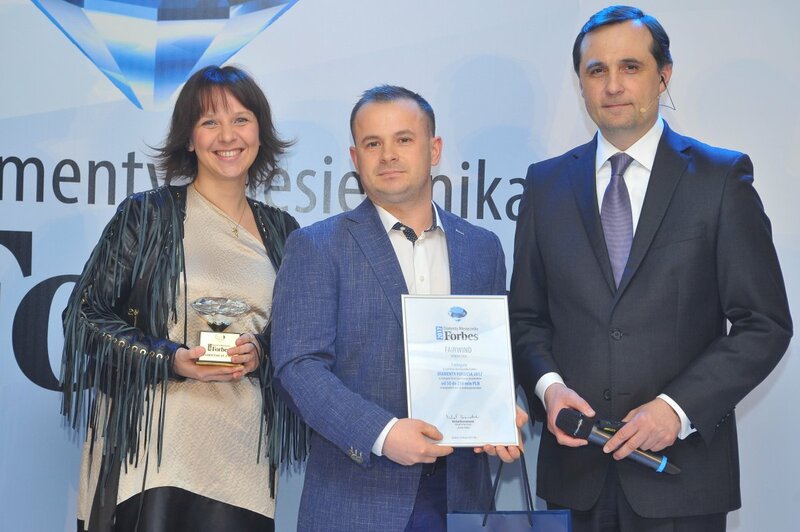 Maciej Suchy, COO Installation Onshore, and Magdalena Radomska, Head of Legal Department, accepted the award on behalf of FairWind’s Polish entity. The award ceremony took place at a Gala at the Dana hotel in Szczecin. We were ranked number one among companies in the West Pomeranian Voivodeship with an annual income of between 50 and 250 million pln. The ranking used the Swiss valuation method for companies, with key criteria being financial performance in 2013-2015, total asset value, credit and payment history, as well as a lack of legal issues. FairWind led on all these criteria in our category, and even ranked 23 overall in the nation. Congratulations to everyone who has made FairWind Sp. z. o. o. a success. Considering our astronomical growth in the last year, as well as numerous agreements signed by our global organization for 2017-2018 with a pipeline exceeding 130 million euros, we anticipate our national ranking will only increase in years to come. Check out the rankings here, or click to read more about Forbes’ Diamonds list.